I don’t know how I made it so long sitting in a normal work desk. I remember the grueling feeling of having to sit down for hours at a time for school and work. This went on for many years of my life. Sitting down is already uncomfortable for normal people. But, when you have ADHD, sitting down can make you feel sort of crazy. Now, as an adult with ADHD, I have the luxury of working from home. I’m free to use stand up desks for ADHD, and drastically improve my level of concentration and productivity while I work. I can tell you from personal experience that there’s an unbelievable difference between sitting and standing when you have ADHD. People with ADHD like to fidget. We bounce our legs up and down. When we’re free to do as we please, we get up and move around a lot. It just makes sense that people with ADHD think better, perform better and live better whenever standing up is an option. And, there’s also a scientific basis for feeling the urge to stand when you have ADHD. Standup Kids has actually devoted a beautiful webpage to the topic of ADHD and sitting. Their webpage reveals important tidbits of information, which explains how movement is a natural response when children with ADHD need to regulate their ADHD symptoms. Standup Kids also has a webpage dedicated to the shocking reality of standing vs. sitting. Their data reveals that most American children are sitting for up to 85% of their waking hours. European children might spend a little bit less time sitting on average. But, sitting is ultimately a health hazard that harms children, adults and elderly populations across most countries of the world. The most unfortunate part about these revelations is that sitting is now widely considered to be the equivalent of smoking. It’s been shown that sitting can lead to heart disease, diabetes, cancer, physical pain, and various other sorts of issues with the human body. My life changed from the moment that I started to stand for 90% of my workweek. I can only imagine how this would have benefited me while growing up. I probably would have been able to concentrate on schoolwork, score higher grades on tests, and have less back pain to deal with. The best time to plant a tree was 20 years ago. The second best time is now. So, whether you’re considering getting a standing desk for your child, or snagging one for your personal home office – now is the absolute best time to use a standing desk. Because the clock is ticking, and your life will probably change for the best once you finally make the switch to using a standing desk. When you use a standing desk, you’ll most likely enjoy greater mental clarity, less physical pain, and better health in general. 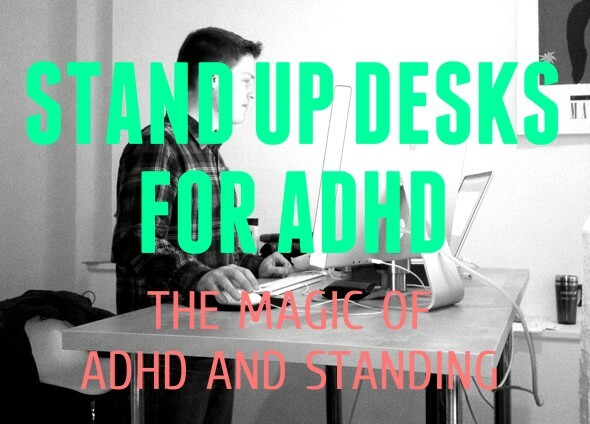 The benefits of using a standing desk go beyond improving your ADHD symptoms, too. Using a standing desk can help you prevent disease, and possibly even save your life. Showing others how to make a stand up desk is one of my favorite methods of helping people with ADHD. This is because creating your own stand up desk is one of the quickest and easiest ways to dramatically improve ADHD symptoms in children and adults. 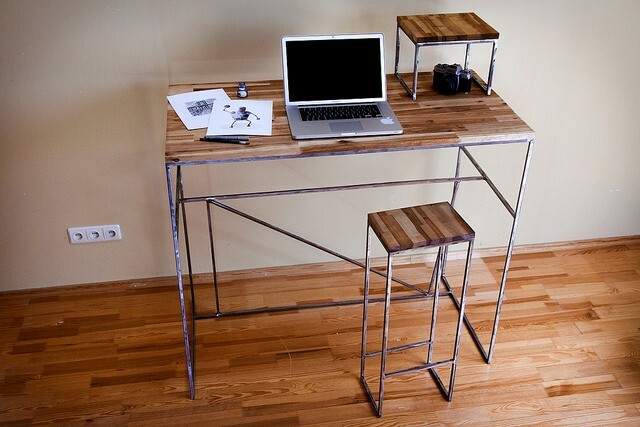 You can make a high-end stand up desk out of beautiful wooden parts. Or, you can make a stand up desk using your kitchen counter as a makeshift desk (I usually eat breakfast and lunch while standing in my kitchen). But, most frequently, people follow simple guides on the internet to create their own standing desk. 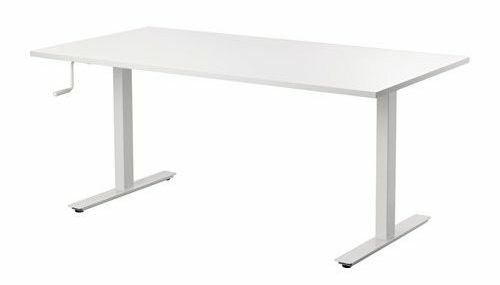 Here’s my favorite guide for making a standing desk: The Standesk 2200 Guide (IKEA Standing Desk). The Standesk 2200 guide shows you how to make a standing desk out of IKEA parts for as low as $22. This is just one way to make a fast and inexpensive standing desk. You have many options available. So, feel free to get creative with your standing desk. Since I’ve started to travel more frequently, I’ve invested in a range of tools that help me work while standing up anywhere in the world. The Roost Laptop Stand (Amazon) is my favorite tool for raising my laptop to eye level. Then, I simply connect my laptop to an external Microsoft Sculpt Ergonomic Keyboard (Amazon), and Logitech MX Master Wireless Mouse (Amazon), and I’m good to go. You have tons of creative freedom to build the ultimate stand up desk that works for your lifestyle. If you don’t have the time or skill set to create your own standing desk, I don’t blame you. Sometimes, you just want to click a button and receive a solution that practically works out of the box. Plus, there’s also the chance that you might need multiple standing desks, if you happen to work with a school or childcare facility. In either case, there are plenty of options available when it comes to choosing a stand up desk. Here are 3 great standing desks for children, adults and students with ADHD. The Alvin Minimaster (Amazon) is a favorite desk among children with ADHD, because it provides kids with the freedom to sit or stand in an instant. This is technically a sit/stand desk. 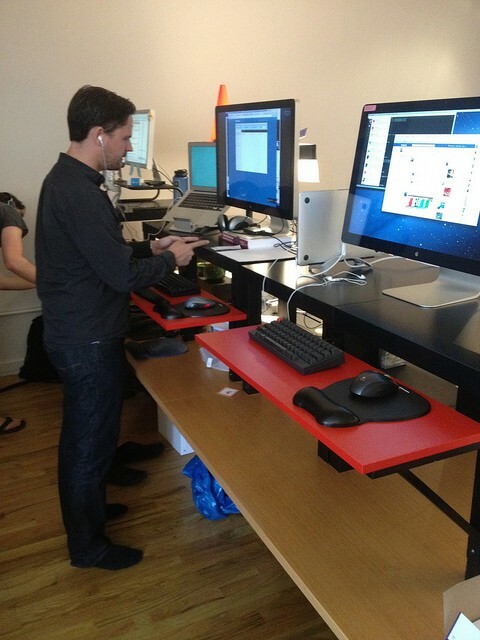 But, many people believe that owning a sit/stand desk is even better than having a simple standing desk. Because, let’s face it. Sometimes, you’re going to need to sit down for a few minutes. And, there’s nothing wrong with that. Real problems only occur when you decide to sit down for hours at a time without moving. Overall, the Alvin Minimaster is a quality sit/stand desk that thousands of people rave about. The IKEA Skarsta is the best standing desk for adults with ADHD, because this desk is relatively affordable, sturdy, professional and effective. In other words, the IKEA Skarsta covers all of the most important bases at a minimal price point. Plus, IKEA’s return policy is surprisingly flexible. So, if you don’t like the desk for any reason, you should be able to return it with no questions asked. I think it’s worth a try. The Marvel Focus Desk XT is a brand of sit/stand desk that’s ideal for school settings. 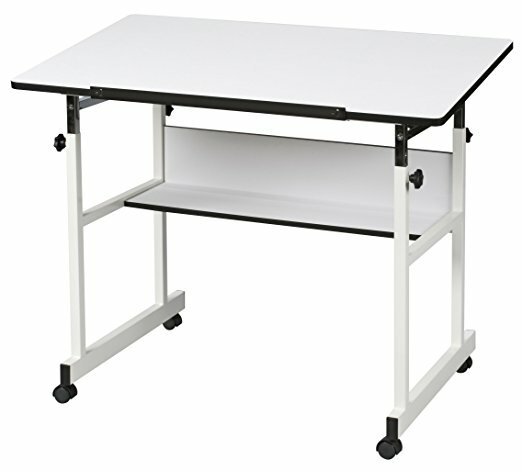 In fact, Marvel Focus Desk XT’s are specially designed for middle schools, high schools and college environments. These desks make it extremely easy for students to get up, move around, and re-engage with their learning environment. I also appreciate that The Marvel Group accepts bulk orders for these types of sit/stand desks. So, this company makes it convenient for school administrators to make the switch to using sit/stand desks. If you’re reading this, and you work with a school, please consider giving your students the gift of standing. You will ingrain healthy habits in the American youth, and provide all students with an amazing tool for learning. 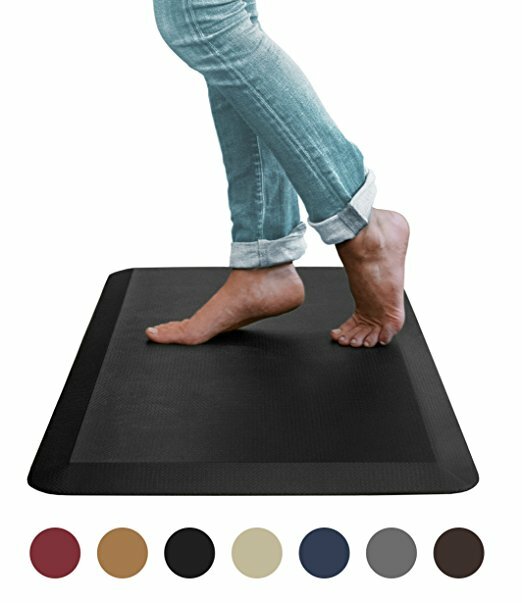 The Sky Mat (Amazon) is one of the best anti-fatigue mats for people who use stand up desks. Using an anti-fatigue mat is an important complement to your standing desk, because it will help keep your feet ultra-comfortable. When you use a stand up desk without an anti-fatigue mat, it’s really easy to get sick of standing in just a matter of hours. Anti-fatigue mats have been used by barbers and hairdressers for many years. So, they’re a proven tool for standing up for hours at a time. I often stand at the computer for at least 8 hours. And, I find anti-fatigue mats to be a big relief for my feet. If you have ADHD or a similar learning disability, and you spend a significant portion of your day sitting down, then it’s going to be imperative that you start standing very soon. I realize there are situations where you or your child may be restricted from standing. And, I’m usually pretty laissez-faire about encouraging people to live their lives however they best see fit. But, physically standing up is one area that I’m really passionate about, because I know how extremely important it is. So, I urge you to please get your entire family to stand up, move around, and be physically active however possible. Encouraging standing is the least that you can do to improve you or your child’s life tremendously. At best, you’ll hopefully choose to promote a lifestyle that includes plenty of physical activity, health and wellness in general. Stand up for you and your family’s health today, and things will only become better for you. Stefan Taylor is the founder of ADHD Boss. He is a writer, traveler, and health and relationship enthusiast. Stefan is most interested in exposing the creative advantages and hyperfocus-fueled success that people with ADHD are capable of achieving. The information on this website has not been evaluated by the FDA, and is not intended to diagnose, treat, prevent, or cure any disease. Copyright © 2019 ADHD Boss™ • All rights reserved • Write for ADHD Boss.